We’ve all had dreams of developing a new attraction, land, or entire park. Whether it is a basic outline, or a fully fleshed out plan, it is fun to dream of the impossible. In the Future World section of Epcot, the threads of daily life have been woven together for almost thirty years, and while the details may have changed, the overarching ideas have remained relatively the same. This week, the Gazette Roundtable was tasked with shaking up that formula in some way! Roundtable Topic: If you could add a pavilion to Future World, what would the pavilion's theme be? What would it look like? What would be in the pavilion? Roundtable Contributors: Matthew Sedler (the geekTicket), George Taylor (Imaginerding), Melissa Loflin (Makin’ Memories), AJ Wolfe (The Disney Food Blog), Chris Fore (Adventure Veranda), Scott Otis, Eric Hoffman (Netmongrel), and yours truly. Matthew – It was a real struggle to answer this question because the existing pavilions already cover so much. 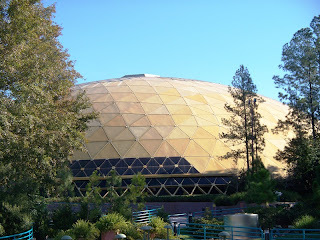 But then an old Disneyland attraction, Adventure Thru Inner Space, gave me an idea: The Hall of Science. The pavilion could be broken down into four sections (since some of the other areas of science are already covered elsewhere): physics, biology, chemistry and geology. Physics could contain hands-on exhibits that demonstrate basic concepts, and chemistry could involve a game show with a large, interactive periodic table of elements. The remaining two exhibits could contain attractions, specifically an updated version of Body Wars for biology and a variation of Journey to the Center of the Earth for geology. Body Wars could have a different story with the new Star Tours branching-storyline technology, while Journey could use the "trackless" technology found in Tokyo Disneyland and DisneySea to take riders through the different layers of Earth. It wouldn't have the same Jules Verne theme of the DisneySea attraction, because that would be an odd fit, but riders could experience earthquakes and a race to escape lava. As for the look of the pavilion, I'd leave that up to the Imagineers. It was hard enough just trying to think of the theme! George – Adding a pavilion to Future World is an interesting topic, but one that will engender as many arguments as positive ideas. What's that old saying? You can catch more Fan Boys with Horizons than Mission Space? It is difficult to think of an area of science or humanities that has not been done, to some extent, in Future World. There are three major expansion areas that we could start with: the Wonders of Life, Innoventions and the Odyssey Restaurant. Looking at the east side of Future World, we have two pavilions based on Transportation. Why not add a third? Hmmm...but the Seas are over with Nemo. And the Land has Soarin' with Patrick Warburton. Plus, EPCOT demolished the World of Motion which highlighted a lot of different transportation throughout the years. Well, this is pretty frustrating. Let's move on to Innoventions. Besides being used as an air-conditioned shortcut to other pavilions, Innoventions never gets much love. At any given time in its recent history, it seems as if there are large segments of the pavilions that are empty. What about creating a virtual EPCOT Center, circa 1986. You can use the simulators from Body Wars, the KUKA Arms and Aladdin's Magic Carpet VR to recreate all of the oft-missed attractions of EPCOT. Imagine riding Horizon or World of Motion. Or even Body Wars! We could take another ride with Figment. I would love for my kids to experience some good, old-fashioned Epcot goodness. Sea Cabs, anyone? 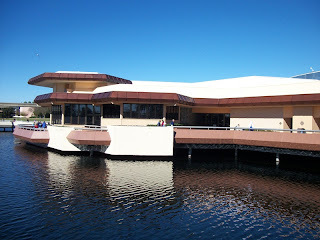 So, for the idea that I think will actually work is to turn the amazing Odyssey Restaurant into the Disney Dining Plan Pavilion (DDPP)! Were you aware that one of the original intentions of the Odyssey restaurant was to provide a multi-EPCOT-cultural dining experience? You would be able to order the specialties from each of the countries around World Showcase and enjoy them without the hullabaloo of having to walk around EPCOT Center. With the DDPP, envision the ability of being able to order Cheddar Cheese Soup without needing to book 180,000 days in advance? Of course, it would cost nine or ten dining credits. Twice that many if you want a FastPass for the DDPP. I wonder why Imagineering hasn't called me, yet. Melissa – The elements of Future World all seem to be covered these days with the exception of anatomy and physiology. The Wonders of Life pavilion and its attractions have been closed for a while now. So how about a pavilion dedicated to science and medicine in our past, present, and future? The attraction ride would utilize motion sensing technology and take guests on an interactive experience about physician care. You and a guest would board a simulator similar to Mission Space but standing up and with a fully immersive screen in front of you. You are in the future and your personal physician is giving you a physical. He asks you to complete some basic tasks; raise you left arm, raise your left leg, etc. The motion sensors will track your progress and track your results on the screen. During the exam your physician begins to educate you on physical care and how it has changed over the years. As he explains past physical care, you are transported in the simulator as it moves along with an immersive digital screen, and creates the illusion that you are traveling back in time while the doctor continues his stories. The experience could take you back to the time of the Civil War, to the great American President Franklin D. Roosevelt, who suffered from polio which was a very unknown disease at the time, and even to popular sports figures of today and how the advance in technology has helped them heal and perform. Once the history lesson is over your physician asks if you are ready for your exam. You and your guest select the test you would both like to complete while the physician calculates and reports your results. After exiting the ride, guests would enter an area full of kiosks and games that educate on the past, present, and future of medicine with information on how to best maintain your health and well-being in the future. And to round it out, since this is a pavilion based on your health, there would be a new counter service restaurant, filled with the freshest, organic, heart-health friendly, smart choices to eat. Guests will leave the pavilion a little more educated in their own personal health and a little more knowledgeable about their doctors and their future. AJ – I'm pretty sure we're all aware of what's missing from Future World. Laser tag. OK -- hear me out. Laser tag is fun. It's never the same experience twice. It exercises your mind and, clearly, uses futuristic technology. But I don't think we stop there. Let's couple this with the pavilion's major theme of social media -- the idea that people are being instantly influenced by others half a world away. I love the idea of a laser tag-esque attraction where guests are actually in ride vehicles. The ride itself has multiple different courses, making this a choose-your-own-adventure type of experience; however, those choosing YOUR adventure are playing from home via a social technology platform (if there aren't enough people playing from home, the ride's computer chooses your course from a number of random sequences). Your goal as a rider is to score points against other ride vehicles via laser attack. Kind of a "bumper cars of the future" feel! The look of the pavilion would be influenced by the ride track or ride system. I have no idea if ride vehicles would be on a track or if they would be suspended from arms that could be moved up, down, left, or right. The story behind the ride (TRON?) would influence the internal look and feel. Likely, based on the ride, it would be dark, with blockades, mirrors, and other obstacles to make the game that much more fun. Can you tell I'm not a ride designer? ;-) I have no idea if this is possible, but it would be kind of cool. And I think the main message of a global communication platform affecting how companies and individuals act, build, and succeed could be very important to Epcot's overall theme. 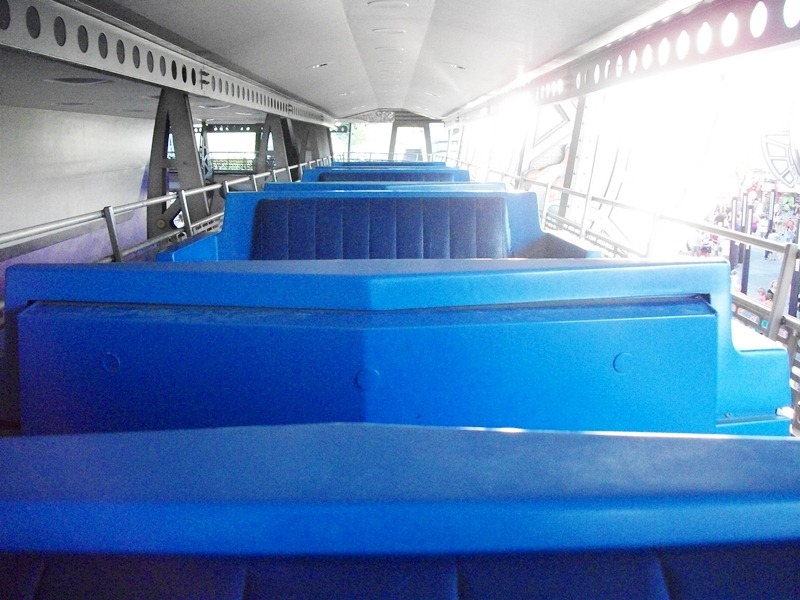 Chris – Rather than add a pavilion as such, I would put a PeopleMover in Future World. - A third station near the "Refreshment Port" on the World Showcase promenade (near the Imagination Pavilion). This new PeopleMover could become the centerpiece for a renewed focus on the future of transportation. Since it passes through the upper stories of the Communicore buildings, I would also return those buildings to an open, airy design motif. And while we are at it, I would re-dedicate some of that Communicore real estate to the theme of transportation. This would include an A- or B-ticket attraction, and also one or more expansive, detailed, "working" scale models showing cities/destinations Of The Future (which we could look down onto as we pass overhead on the PeopleMover track!). In "phase two" - the second and/or third stations on the Future World line would become common stops for a second PeopleMover in World Showcase (again, not originally my idea). For "phase three", this would dovetail nicely with adding those new monorail lines to the other two theme parks (and perhaps Downtown Disney). Yes, such a system would likely be cost-prohibitive. But it would also be awesome. A guy can dream, can't he? Scott – I would choose an Earth theme, focusing on the glory & majesty of America's Greatest Idea, her National Parks. From the abundant wildlife and stunning geothermal features of Yellowstone to the majestic waterfalls and sheer granite cliffs of Yosemite. From the grandeur and depth of the vistas of Grand Canyon to rocky coasts and seaside villages of Acadia. America's National Parks would make an amazing Epcot Future World pavilion. There would be a long turn-of-the-century steam train journey through the great National Parks of the American West, reminiscent of the locomotives that introduced the East Coasters to the idea of preserving America's most beautiful treasures for the enjoyment of the people, for all eternity. This train would go through Glacier, Yellowstone, Grand Tetons, Zion, Bryce Canyon and would culminate with the breathtaking rim-side views of the Grand Canyon. This would actually tie in with Walt's interest in nature and the outdoors, old Disney cartoons, True-Life Adventures and particular scenes from current and extinct attractions, such as Big Thunder Mountain Railroad, Mine Train Thru Nature's Wonderland and the Disneyland Railroad. Of course, the pavilion would be sponsored by the National Parks Service and would be staffed by Park Rangers. Eric – This month’s topic really threw me yet again - thanks Ryan! In thinking about all that Future World represents and in thinking back on some of the pavilions that have gone by the wayside it is surprising how much technological achievement is showcased. So, in the truest spirit of Epcot, EPCOT Center, no, wait EPCOT I would love to see a pavilion dedicated to Walt’s original vision of EPCOT. As originally envisioned, EPCOT was to be a very real model community, planned, built, and governed using the newest and most cutting edge ideas possible. In Walt’s own words; "EPCOT will take its cue from the new ideas and new technologies that are emerging from the forefront of American industry. It will be a community of tomorrow that will never be completed. It will always be showcasing and testing and demonstrating new materials and new systems." While it is entirely beyond the scope of a single pavilion to fully portray, (indeed the Epcot we have today doesn’t even really begin to fully describe the concepts required to make Walt’s vision a reality) it would be a great tribute to Walt to have a pavilion that simulated what living in this type of community would be like. During the ride-thru I am picturing mini-vignettes much like in Spaceship Earth that would show how life, work, and leisure are realized in EPCOT. The ride vehicles could be updated versions of the monorail and people mover transportation concepts intended for EPCOT. This would tie in those existing vehicles from elsewhere in the park and help connect in people’s minds why they are there and the concept behind them. Granted, it would take the creativity and vision of Imagineers to make this an exciting and fantastic pavilion, but the larger than life vision of EPCOT deserves this exposure. What a story this is to tell! Ryan – My first inclination is to jump back into the well-trodden territory of a health and wellness pavilion. I have strong conviction about a pavilion of this sort, and if you don’t believe me, simply check out last week’s episode of the WDW Radio Show. However, something new that I would love to see is a pavilion constructed around the history of, well, construction and architecture. From the first glimpse, let’s make this structure appealing to the eye and awe-inspiring, say modeled after a famous work by Frank Lloyd Wright or a seemingly impossible M.C. Escher-like design. Inside, a dark ride would take guests through the history of architecture, stopping to marvel at some of the greatest structures in history: the pyramids, Roman aqueducts, the advent of the skyscraper. The tour would also include tours through housing structures, such as pueblos, peat houses, and igloos, explaining what they are made out of and why the climate and environment required such building techniques. In a post-show area, guests could venture into building zone competitions, where two teams must build the sturdiest, tallest, and most eye catching structure with a given set of buildable supplies (such as giant foam LEGO blocks or some other building material) and a time limit. Also included in the post-show would be a building code show. This theater drama would depict why building codes are a stringent as they are by demonstrating a house built with proper materials and a house built without and then sending the structures through a hurricane or earthquake. Scattered about could also be a multitude of station where you could build your own treehouse, say alongside Phineas and Ferb, and email a copy of the plans to yourself. Alright, I’m excited, let’s get building! While it may seem that Epcot’s Future World has the market cornered on pavilion themes, I think the Roundtable has, in our own special ways, shown that this is not the case. So, go on, put on that thinking cap and dare to dream about the tomorrow of Future World. What would you build there? I LOVE the WEDWay idea! Its one of my favorite attractions at MK and I'd love, love, LOVE to see it at Epcot! Scott's idea = homerun, brilliant! !